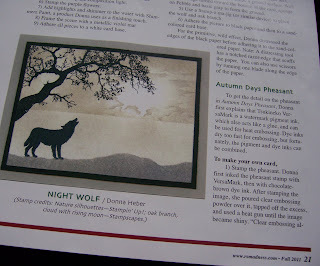 Donna's Designs: I've Been Published! I am just ecstatic and can finally tell you about my wonderful news! 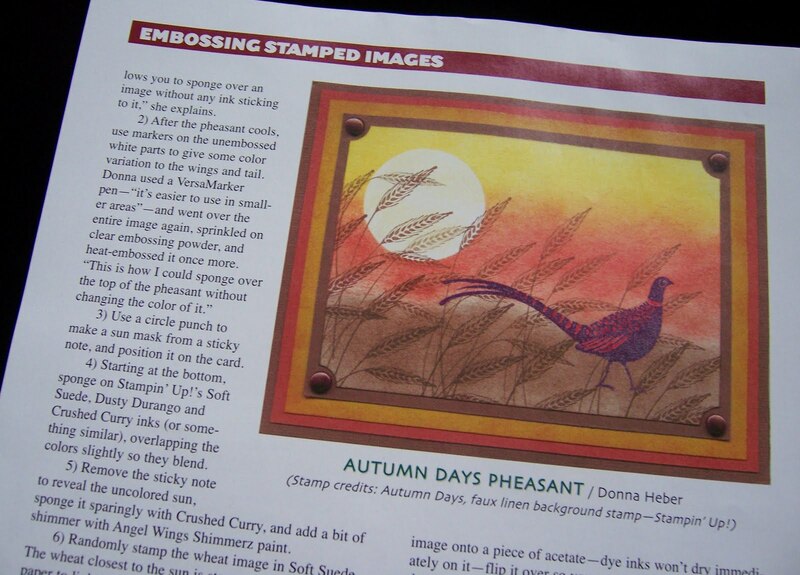 I am featured in the Fall 2011 issue of RubberStampMadness Magazine in their Card Shoppe section on page 20. I have known about this for quite a while, but when I actually received the magazine in the mail it was like a dream come true! I never thought when I first started stamping my cards would be published. Many of you know me as “Ocicat” on Splitcoaststampers. Thanks so much to all of you for your support and sweet comments throughout this journey. I’m glad to be able to share a bit of joy with you today. I would like to thank Roberta Sperling, editor of RSM, as well as staff writer Barbara Blanks, for the time they spent with me putting together this article. 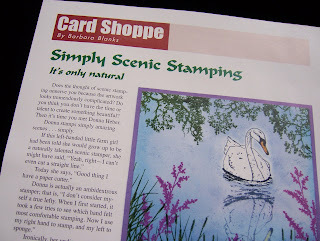 Here is a peek at The Card Shoppe section which talks about my stamping and features three of my scenic cards. I’m sure you recognize them from my blog. Your cards are very unique. Congratulations on having your designs published. Congratulations! Super news and well deserved! Oh Donna, how wonderful for you. I know from following you what lovely cards you create, how nice it is to see your talent highlighted in such a great publication. Way to go girlfriend. Congratulations Donna! I know how excited you are and well you should be. Congratulations Donna! LOVE LOVE LOVE all the cards! Congratulations Donna, these are gorgeous. I love all the cards! wow donna, what great news congratulations well deserved. 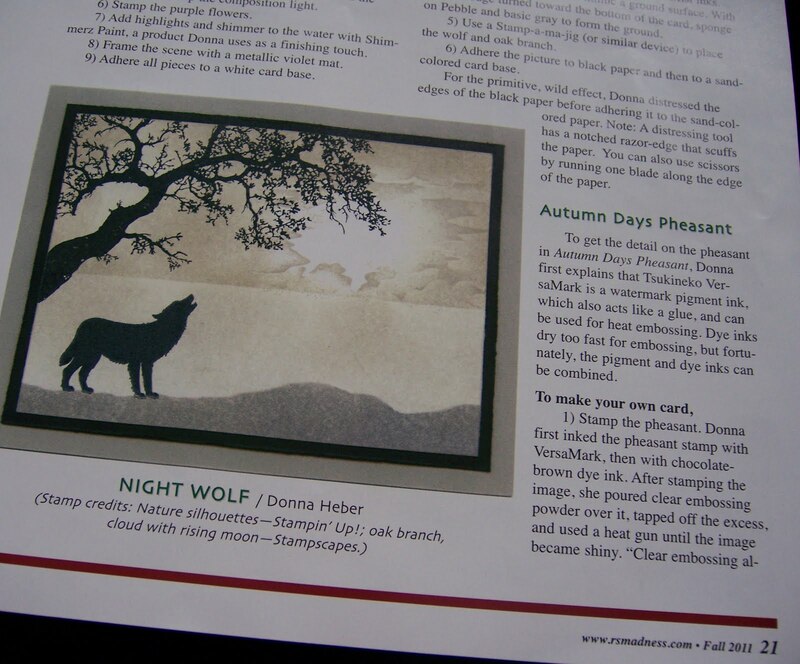 your scenery cards are gorgeous I'm not surprised that they have published it. Congratulations! You are a great inspiration and are very deserving of the honour of being published! Wow!! Congratulations Donna!! This is well deserved!! Your cards are always so beautiful and I always enjoy your blog. Wow, wow, wow! Congrats ... terrific news and well deserved! I'm so happy and excited for you Donna! I've always known that you are sooooo talented! Enjoy the ride on being published! Donna, this is just absolutely wonderful news! I will be looking for it in the stores as it would be even more fun to have my hands on it! Kudos to you!! super news. Congratulations to you!!! I know it must be very exciting!!! Congratulations. Your cards are awesome. 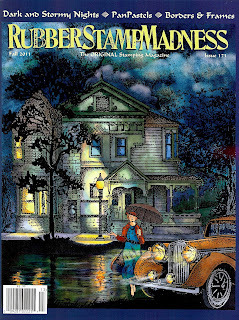 I have been intending to subscribe to Rubberstampmadnss. This finally made me do it. I look forward to seeing you creations in my own copy of the mag. P.S. For some reason, I can't comment using my Google account. What a well-deserved honor for you! 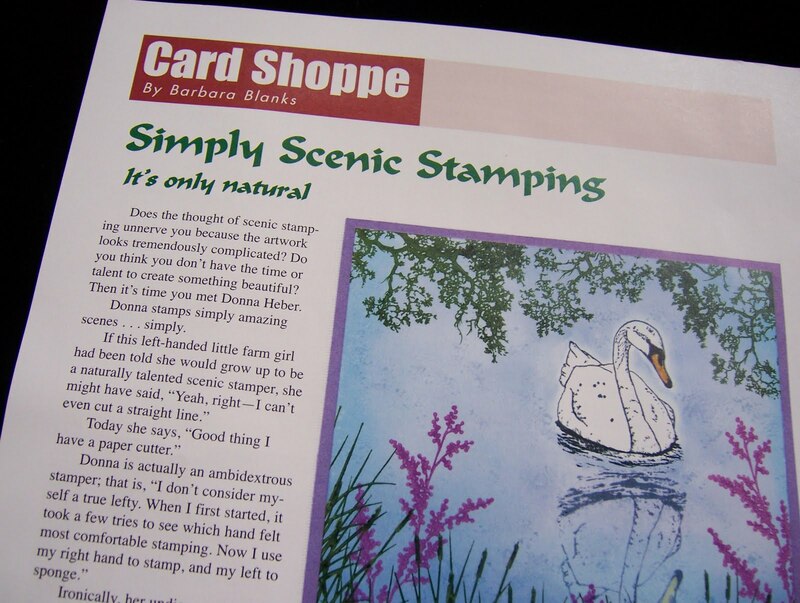 I love your stampscapes. So happy for your success! Congratulations dear friend. How fabulous for you! Congrats! What great cards! Wow Donna, this is great!!! With the quality and designs of your cards, you deserve this type of recognition. You know you inspire me for my cards! Congrats! Those are awesome cards too. What great news. Congrats. Beautiful cards. I absolutely love the wolf one. I collect wolf things so it really caught my eye.